Did you see our ad in the Kansas City Star? Donate here to help us spread this message further. Help us show Esther Koontz that we support her courageous stand. Learn more about her case, here. 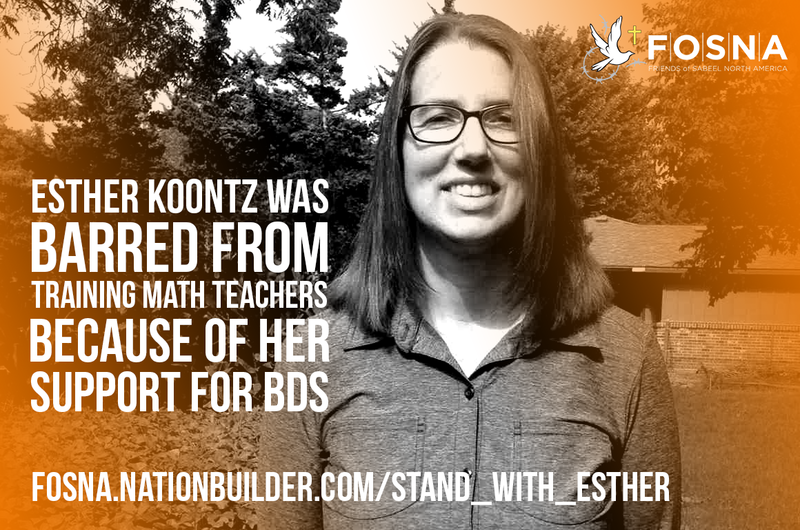 In August, Ms. Esther Koontz, a trainer of math teachers in Wichita, Kansas, and a member of the Mennonite Church USA, learned that she would not be allowed to participate in a professional program for which she was qualified because she would be required to sign a statement affirming she is not presently engaged in a boycott of Israel. When Ms. Koontz refused to sign that statement, she was informed she would be ineligible to receive payment as a state-contracted teacher trainer. In gross violation of her First Amendment right to free speech, Ms. Koontz was thus denied a professional opportunity based on her conscientious determination to preserve her right to boycott companies that profit from violent and repressive business endeavors. This is what costly solidarity looks like. This is Christian faith and conviction applied in real time. This is moral authority speaking loudly not simply through words, but through action. Indeed, the June 12, 2017, letter from the National Coalition of Christian Organizations in Palestine explicitly pleads for our “costly solidarity” including creative, nonviolent resistance to the military occupation of Palestinian land. On July 6, 2017, the Mennonite Church USA resolved overwhelmingly to review its investment practices for the purpose of withdrawing investments from companies that profit from the military occupation of Palestine. The Mennonite Church USA urged all church members to review their investments in a similar way. The Clergy and Seminary Action Council of Friends of Sabeel North America honors the Mennonite Church USA and especially Ms. Esther Koontz for their bold actions. We express our respect, our solidarity, and our Christian faith in affirming this costly witness. We are grateful for this expression of conviction which adds authority and power to the ongoing work of the church to end military occupation of Palestine—a military occupation now in its 50th year. We are pleased to know the American Civil Liberties Union will argue Ms. Koontz’s case on Constitutional grounds. May God grant strength, relief, and many steadfast allies as this case plays out in the courts. We aim to be among those allies. Click here if you would like to join the Clergy and Seminary Action Council. This new council brings faith leaders together to strengthen our impact in the struggle for Palestinian human rights and we need you!